Here's a topic that comes up frequently on our Metal Mouth Message Board: changing your own ligatures (or powerchains). Let's say you ate some curry and now your ligatures ("o-rings") are stained. They look yucky. You really want them to look nice again. Hey, maybe you could go online and buy some ligatures to change them yourself! After all, who wants to walk around with yucky looking ligatures for weeks on end until the next ortho appointment? How hard can it be? Well, it's not so simple and it's not a good idea, according to several orthodontists as well as a website that sells ligatures! Dr. Christopher Jernigan, DMD of Columbia, South Carolina says, "Changing ligatures yourself seems harmless but you could be adversely affecting your treatment. When a ligature is used it begins to stretch and "decay" (as well as discolor). At this point the force applied to your teeth is "deactivating". This is normal and healthy. Many times at an adjustment, all we do is re-tie your ligatures. In effect, doing this at home is actually reapplying new forces to your teeth not under the supervision of an orthodontist. If things were moving poorly at first then one could be making it worse by re-ties at home. My advice is to not do this at home because only an orthodontist is trained to make these decisions. Besides, you may break a bracket." Dr. Jeffrey S. Genecov, DDS, MSD, FICD, FACD of Dallas, Texas adds, "Any damage that's done to the braces, having them come loose, accidental injury, etc from unpracticed hands could slow down and extend treatment times. While all of these skills are learned and learnable, this what we do every day all day. That's why in my office we encourage patients to come in and have their ligatures changed whenever they need to -- and also one reason why we're almost 75% using self-ligating brackets." Several other orthodontists and dentists were asked the same question and all agreed that changing your own ligs is not a good idea. 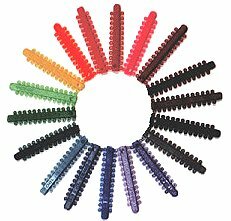 In addition, the owners of JawProducts.com, a website that sells ligatures stated, "We do not recommend you changing your ties yourself. Please follow the advice of your orthodontist." If you need fresh ligatures or powerchains, it is best to call your orthodontist and go in for a quick appointment to have them changed. Never attempt to change your ligatures or powerchains, double up on your elastics, or modify your treatment in any way without first discussing it with your orthodontist or treating dentist. For more information about ligature stains and how to avoid them, read our article Help! Did I Stain My Braces?